Mom and I have been dying to try these cupcakes for months now, but they are really expensive. That didn't stop Mom and I from drooling over the box every time we see it at the market. After a quick spin around Stop & Shop, Mom and I couldn't seem to decide on a suitable Bite of the Week - until we ended up in the frozen food aisle. We spotted the box of cupcakes and finally gave in. 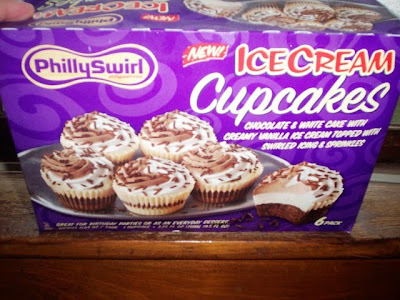 At $4.99 for the six ice cream cupcakes (we aren't sure if this was the sale price or the actual price), we hoped that they were going to live up to our high expectations. Fortunately, they did! THE VERDICT: Amazing! Although some of the frosting tops got squashed from being in their covered plastic tray, they came out looking exactly like they did on the box ... and just as tiny. However, the taste made a big impression. Each cupcake was made with chocolate and white cake and topped with vanilla ice cream, icing, and sprinkles. At the bottom was a thin chocolate shell to hold it all together. The cupcakes were a bit hard to dislodge from the sections in the tray and their wrapper, but once we got them out we were hooked. It was like having an individual piece of ice cream cake - cool, creamy, and the perfect mixture of frosting, ice cream, and soft cake. The box informed us that these cupcakes would be perfect for a party, but we think that they're great anytime. A birthday party in your mouth!